Description: In this book, Cavan W. Concannon explores the growth and development of Christianity in the second century. He focuses on Dionysios of Corinth, an early Christian bishop who worked to build a network of churches along trade routes in the eastern Mediterranean. 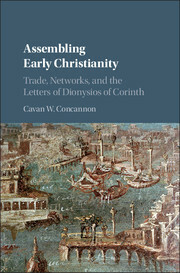 Using archaeological evidence, and analysing Dionysios' fragmentary letter collection, Concannon shows how various networks and collectives assembled together, and how various Christianities emerged and coexisted as a result of tenuous and shifting networks. Dionysios' story also overlaps with key early Christian debates, notably issues of celibacy, marriage, re-admission of sinners, Roman persecution, and the economic and political interdependence of churches, which are also explored in this study. Concannon's volume thus offers new insights into a fluid, emergent Christianity at a pivotal moment of its evolution. Introduces readers to a forgotten but very important early Christian author/bishop and will be of interest to anyone studying early Christianity and its development. Introduces a new way of thinking about historiography, and encourages readers to think differently about how we write histories of groups like the early Christians. Fuses archaeology, historical analysis, and critical theory in new ways; anyone studying Mediterranean archaeology, classics, or religious studies more broadly will find interesting insights which they can apply to their own work. Citation: Michael K. W. Suh, review of Cavan W. Concannon, Assembling Early Christianity: Trade, Networks, and the Letters of Dionysios of Corinth, Review of Biblical Literature [http://www.bookreviews.org] (2019).